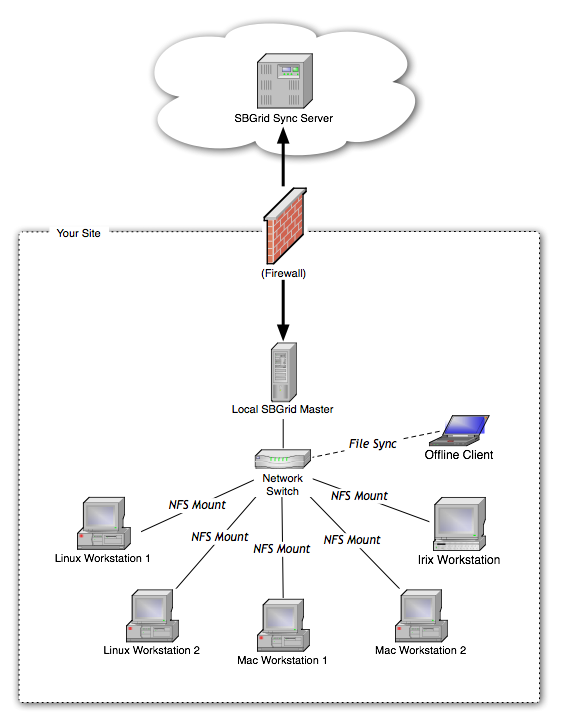 The SBGrid Software Suite is designed to be installed on a single computer at your site, which will then share that installation with all the workstations on your network via NFS. We refer to this computer as the site "master" server. The master server will require at least 250 GB of free disk space on a case-sensitive file system and must run some variety of UNIX. The installation script will download the software branches you select, and then install a cron job that will run regularly to check for updates. Software installation and update are initiated from your local server at your site and downloaded from our servers. http is used to query our servers to check for update, and rsync is used to download the updates. Outbound HTTP, and RSYNC is necessary. * The names and email addresses of lab members that will use the software. One user may be designated to receive the majority of our correspondence if you would prefer not to hear from us too often. Once the email has been received and your information has been entered into our system, we will email you a script you will run that will begin the remote installation process. Instructions for running the script will be included in that email, and are reproduced below for reference. A site installation is performed using the sbgrid-admin utility. Create an 'sbgrid' user on the machine that will host your software installation. This should be a normal, unprivileged user account. Log in as this 'sbgrid' user. Download the installation script from the URL provided in the account creation email. The script will walk you through configuring your installation, downloading the software and installing a cron job that will keep the software updated at your site. You will need the site name and install key provided in the account creation email. The installation may take anywhere from several hours to a day, depending on your network and the number of applications available to your site. For some linux distributions, the shipped version of tcsh does not support shell variables longer than 4096 characters. Since the current PATH in our default shell initialization is larger than that, you will need to update tcsh. RPMs for Red Hat 4/5 and CentOS 4/5 are provided at /programs/i386-linux/system/RPMS. Note that the IRIX branch is only compatible with tcsh; there is no sh-compatible configuration for this branch.